She dreamed she was falling, her Lightsaber falling faster, tumbling further out of reach. As she fell, Imperial ships exploded around her head before they too faded away. Only then did the rocky surface come into view, hurtling at her faster with each passing second..
“Ugh!”, the Twi’lek sat bolt upright, willing her eyes to stay open. She took in her surroundings – her Lightsaber components, her room at the Sith Academy, the inviting shower room. Talitha wrapped her arms and lekku around her legs, in a kind of self embrace. The seconds ticked by, and only when she managed to relax her shoulders did she force herself off her bed and shuffle to the washroom. The mirror was covered in sand dust, abandoned to the climate in her absence. Clearing some away she took in the tired face of a weary traveller. This room had been home since being brought here by the Sith, but now she was back after her visit to Ilum, it felt more like a prison. It had been her daily mantra. But the next two days would provide her greatest trial to date. She had to complete her Lightsaber and then fight for the right to leave Korriban. And the thing she feared most of all – being assigned a Sith Master. Though not encouraged, killing an Apprentice who didn’t meet expectations could easily be accomplished…and excused. “One step at a time, girl.”, she muttered, rubbing her eyes. She padded into the shower and enjoyed the release of her skin from the travel fumes and the smell of TaunTaun. Even the cold of Ilum was forgotten, even if the liberation it had provided was not. Once warm and cleaned she stepped out and slowly toweled herself dry. Selecting some tan-coloured clothes from her skant collection, she wrapped them tight around her before refitting her Twi’lek head jewellery. She felt better for the wash – and more positive. Today after all was Lightsaber construction – and her final Lifebinding class. Returning to her satchel, she dug out the small case containing her crystals from Ilum. Without the Ilum climate freezing all her senses, she could feel the Living Force radiating from them. Talitha snapped her head around, blinked and then smiled. I’m glad you’re still around… she echoed back. The room fell silent again. Lord Vitae was right of course. Freed from Korriban’s oppressive darkness, she had found the Force in a new way. She had known it was a Jedi planet, but plenty of Sith forces were there too. Even her new pet TaunTaun was an embodiment of the Force. “Okay, let’s do this”, she told herself, packing her parchments and Lightsaber components into her satchel. Ensuring her War Blade was well secured to her back by her upper robe she strode out of her quarters. Today was either the penultimate day of her life, or one day closer to leaving Korriban. Either way, she would be free. As she made her way to the chambers, Rala Khan found her and they walked together in comfortable silence. They had a shared experience now, and a shared understanding, despite having totally different experiences of the Force. Some of the male Acolytes were wielding their new Lightsabers, fashioned from artificial crystals, bound by nothing more than sheer will. A few female Acolytes joined in the bravado, but some the males just exuded arrogance. How that ego would be tested in the next twenty-four hours. The two girls made their way up the stone steps and into a circular chambre. Darth Tykrus was in the centre while Acolytes gathered around. Nearly all of those who had left for Ilum had come back. Talitha tried not to think what had become of those who hadn’t returned. “Acolytes, give yourself space on the floor and lay out your Lightsaber components. And be swift, I don’t have all day.”, Tykrus bellowed. The Twi’lek did as she was told, with Rala not far away. She took everything she needed out the satchel and placed everything else behind her. Her heart was pounding inside her chest, threatening to give her away with every beat. “You may have been misled to believe this is a Jedi Technique. Indeed, the Sith have been called ‘those trained in the Jedi Arts’. But the Force is with us as much as with them. Take heed of this fact.”, Tykrus warned. “Master?”, a young Zabrak piped up. “Is the Force not with the Sith more than the Jedi?”, the Zabrak challenged. The Acolyte fell silence, rebuked. Only his red skin hid his embarrassment. Tykrus looked around the room. Only half would survive the next two days and then he could get back to developing the war strategy. With that he stormed out, a couple of Honour Guards blocked the only exit. It was time. Talitha sat cross-legged and stared at the pieces before her. She cast a glance over at Rala, who threw a nervous smile back at her. They held the gaze for a couple of seconds before nodding to each other – you can do this, was the message. Opening her case of crystals she took out one and laid it with the other pieces and closed her eyes. Recalling meditation classes, she drew on her connection to the Light Side, and attempted to link to the Dark Siders around her. She had to hide herself – and balance would do that. The Force enveloped her like a long-lost friend and she fell into a trance. In her mind’s eye she stopped seeing mechanical components and metal cases, but saw swirls surrounding spaces shaped like those parts. Everything bound together. Capacitors joined to power sources, crystal carefully placed between pins. The curved casing with additional reflectors holding everything in. The swirls now surrounded a single object, her new Lightsaber. She saw herself taking hold of it and igniting it, the turquoise blade springing from within, a near white glow in the core. Her mental energy drained from her, she fell back onto the hard floor, her new Lightsaber falling onto her stomach. Instinctively holding onto it, the Twi’lek passed out. “Ow, my head!”, she cried as the bright lights of the medical wing invaded her eyes. “Please remain calm, life signs are normalising”, the med droid intonated. “Life signs? What…what happened?”, she questioned, shielding her face from the glare of the lights. “Darth Tykrus asked me to relay that you were successful in your trial, but passed out in the chambre. This is not uncommon. Do not be alarmed.”, the droid replied. “My Lightsaber?”, she croaked, fearing she had lost her ticket off Korriban. “Is here my Apprentice.”, said a figure a mere outline against the blinding light. Talitha’koum felt the smooth curvature of her hilt passed gently between her hands and she smiled. Only then did it dawn on her. “Droid dim these stupid lights, my Apprentice isn’t blind.”, the figure commanded. “Yes my lord” it replied, adjusting the brightness via a Datapad connection. The Twi’lek dragged herself into a sitting position for the second time that day. “Stating the obvious but yes.”, the Dark-skinned Lord smiled. “Lifebinding?”, Talitha was fighting through the fog of her trance-induced coma. Vitae held up a hand that told her Apprentice to be quiet. 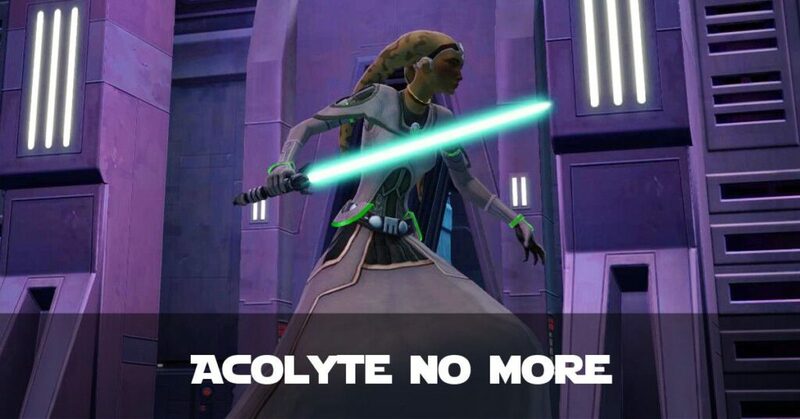 If she survived tomorrow, she would be an Acolyte no more. Vitae was taking her as an Apprentice. Maybe she could get through this after all. The Twi’lek’s brow furrowed. Something was amiss. She wasn’t being told everything. But drained from the day’s exertion she couldn’t piece the puzzle pieces together. Little did she know that she wouldn’t have chance to complete the puzzle before tomorrow’s day of reckoning.